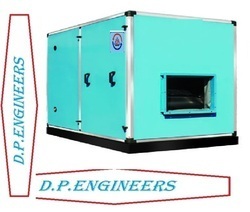 Air Washers Manufacturers, Suppliers D. P. Engineers is the company promoted in India by the Executives having a combined experience of more than 15 years in the filter & Air Conditioning related industry. Blower : Dynamically Balaced Forward Curved, DIDW Type Make DPENGINEERS/ Imported. The standing we have conquered in the country is owing to our presented plethora of Single Skin Air Washer. These provided air washers are in accordance with the quality standards and guidelines set by the worldwide market. Attributed for their strength, these provided air washers have become a preferred choice of our patrons spread all over the country. 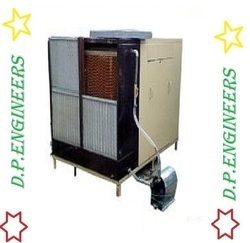 Double Skin Air Washer provides vide range of capacities of Double Skin Air Washers which suits to the requirement of consumers under the brand name of DPENGINEERS. Blower : Dynamically Balaced Forward Curved, DIDW Type Make DPENGINEERS / Imported. 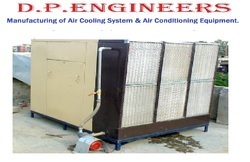 We are the leading manufacturer, supplier and exporter of Evaporative Cooling Machine. We manufacture air washer or evaporative cooling machine which is extensively used in cement industry, chemical industry, hotel industry, pottery industry and others. 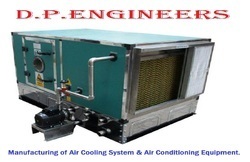 The total assembly of Evaporative Cooling Machine is mounted on a horizontal member of heavy mild steel channel. 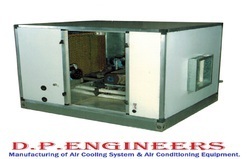 Furthermore, air washer or evaporative cooling machine is manufactured in compliance with required standards and can be offered within given time frame. 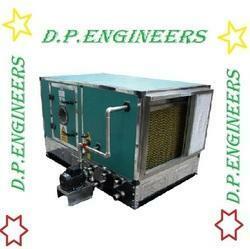 We provide this Evaporative Cooling Machine to our clients as per order. Fan Section: Constructed in 16 SWG GI Sheet with Inspection Doors. Wet Section: Constructed in 16 SWG GI Sheet. Water tank: Constructed n 18 SWG SS- 202. Blower: Forward Curved, DIDW Type Make DPENGINEERS / Imported. Electric Motor: Three Phase, TEFC squirrel cage induction motor of standard makes (Crompton, ABB and Kirloskar etc.). Drive Pulley: V-Groove without/with Taper Lock hub. Pump: Monoblock make Crompton / Kirloskar. Filter: HDPE/Aluminum/GI Mesh Filter, Micro Vee, Hepa as per requirement. Pipe Fittings: PVC piping with all Necessary fittings such as float valve, quick fill, overflow & drain ports. Base Frame: The Total assembly is mounted on a horizontal member of heavy mild steel channel. Fan section: Constructed in GI sheet with inspection doors. Wet section: Constructed in GI sheet. Blower: Dynamically Balanced Forward Curved, Didw type makes DP ENGINEERS / Imported. Electric motor : Three phases, squirrel cage induction motor of standard makes (Compton, ABB & Kirloskar etc. ).